“Maru” means “circle” in Japanese. In many ways it’s a fitting name for Taylor Hale’s and Jonathan Sundeen’s new sushi venture, which the pair plans to open on Mill Street this summer with partner Peter Coyne. After spending a number of years in California, working in restaurants and playing music together, the 34-year-old Aspen High School graduates Hale and Sundeen will reunite in their hometown where they will plant roots once again. “Circular has a lot to do with continuity and coming back to our hometown,” Hale said Wednesday. 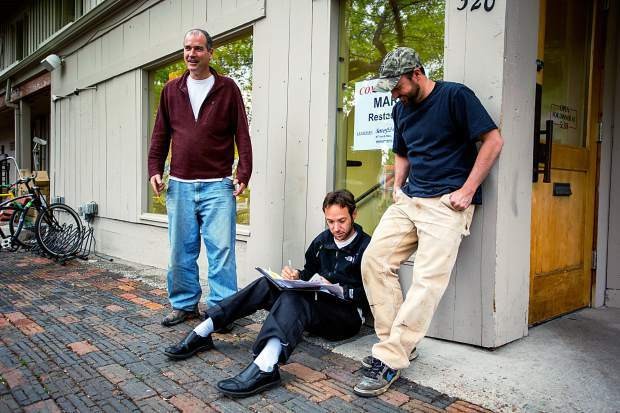 For five years the trio has considered the possibility of opening a restaurant in Aspen. It wasn’t until April, when Takah Sushi owner Casey Coffman announced her restaurant’s closing, that the group began seriously considering making a push. Sundeen, who will manage Maru’s floor, said having a local connection has been a major boost, as friends and family have offered an immense amount of support in helping to get the restaurant off the ground. The goal is to open before July. Coyne, who will manage the kitchen, said the intention is to maintain a local atmosphere, much like the one Takah developed in its 34-year run, but he was hesitant to detail an exact price point for the Maru menu. The group is still determining its business model, he said. “We definitely want to make it accessible to locals and have a community atmosphere,” Coyne said. Maru will become the third sushi restaurant in Aspen, competing with Kenichi and Matsuhisa. Hale, who will run the Maru sushi bar, spent 12 years at Kenichi, while Coyne previously worked at Matsuhisa. More recently, Coyne served as kitchen manager at Pyramid Bistro. Sundeen spent a number of years between Los Angeles and San Francisco, managing and owning various operations. He returned to Aspen in October. Hale said the group’s connection in the local restaurant industry will allow Maru to sell very specific products. While they anticipate employing a number of menu mainstays, he said Maru’s access to seasonal Japanese products will set the restaurant apart. The restaurant also plans to buy seasonal produce from farms in Paonia and New Castle. The group has been filling its staff through word of mouth in the Aspen community. Robbie Parker, who also spent time at Matsuhisa, will manage the bar, and Hale said most of the sushi chefs have local roots. Patrons can expect to see one, two or all three owners working in the restaurant, especially early on. “To start, obviously all three of us are going to be in there all the time,” Sundeen said.